Today, I bought a Moor Park apricot for my garden. 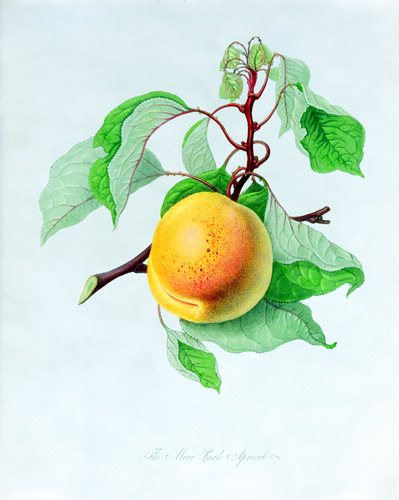 "It was only the spring twelvemonth before Mr. Norris's death that we put in the apricot against the stable wall, which is now grown such a noble tree, and getting to such perfection, sir," addressing herself then to Dr. Grant. "The tree thrives well, beyond a doubt, madam," replied Dr. Grant. "The soil is good; and I never pass it without regretting that the fruit should be so little worth the trouble of gathering." "Sir, it is a Moor Park, we bought it as a Moor Park, and it cost us--that is, it was a present from Sir Thomas, but I saw the bill--and I know it cost seven shillings, and was charged as a Moor Park." "You were imposed on, ma'am," replied Dr. Grant: "these potatoes have as much the flavour of a Moor Park apricot as the fruit from that tree. It is an insipid fruit at the best; but a good apricot is eatable, which none from my garden are." "The truth is, ma'am," said Mrs. Grant, pretending to whisper across the table to Mrs. Norris, "that Dr. Grant hardly knows what the natural taste of our apricot is: he is scarcely ever indulged with one, for it is so valuable a fruit; with a little assistance, and ours is such a remarkably large, fair sort, that what with early tarts and preserves, my cook contrives to get them all." Today, I bought an apricot for my garden. It cost $19.99, and was charged as a Moor Park. Did you know that the garden at Moor Park may have originally been created by a woman? Lucy Harington, Countess of Bedford (1582-1627) may have created the gardens at both Moor Park and Twickenham. Her garden at Twickenham Park was an example of sophisticated seventeenth-century allusion. Sir William Temple praised the work done at Moor Park, as ‘the perfectest Figure of a Garden I ever saw, either at home or abroad ... made ... with very great care, excellent Contrivance, and much Cost’. I've just written a book about the history of women gardeners, Gardening Women and I know it's really hard to find evidence about early women gardeners but it would be lovely to think your apricot had been cultivated in such an early garden, wouldn't it? What a lovely post! Congratulations on your new tree; I will plant a star magnolia (Magnolia stellata) tomorrow. Very interesting blog. A nice change. Jane Austen is one of my favorite authors.Not only for the rich content and theme of her novels, but for the exclusive description of roses, trees and gardens. Nice post. @Catherine: Thanks for the information. Hello! Just dropping by and wanted to say great blog. Garden History is fascinating! Thanks so much for the post. My husband just bought me this cultivar for our anniversary. This makes it all the more special to me.